Douglas Binder, Dudley Edwards and David Vaughan, a pop-art 'collective' that were known as BEV, were originally based in a studio in an old disused factory in the Chalk Farm area of London on a site opposite the home of fashion photographer David Bailey. Their particular speciality was the creation of pop-art murals on buildings and vehicle bodywork, and the decoration of furniture, which started more by accident than design due to the fact that their adopted premises had very little in the way of furniture in the early days and which they decided to brighten up a bit. Dudley Edwards recalls: "We only had money for a couple of chairs and a chest of drawers inside this huge studio, and the place looked a bit drab, so we thought, 'Well, we're artists, we might as well paint the furniture.' After that we painted anything and everything." Douglas Binder explained " A guy from a local antiques shop came round and said, 'That's rather nice. I bet I could sell that'. And that's where it started'. Binder and Edwards were acclaimed as the first artists in Britain to produce painted furniture since the Omega Workshops 1913-20. The group eventually created hundreds of pieces that were sold both in the UK and the USA and became sufficiently iconic of the period to warrant being the subject of a feature in The Sunday Times, with illustrative photography provided by Lord Snowdon. Although operating collectively under the 'BEV' name, the three men were distinctly individual artists who were all involved with the various personalities and events of the time. BEV and other collaborative artwork images are the copyright of iconic photographer Martin Cook and are reproduced here by kind permission. Many more of Martin's images may be viewed on the zenfolio site. Douglas Binder was born in Bradford in 1941and first started displaying his artistic skills at Wellington Road Primary School where a teacher warned him to be prepared for disappointment, as binder recalls her saying: "We had a boy here before you and he used to draw and paint very well. You'll have to be very special if you want to do even better." As that 'boy' turned out to be David Hockney, she probably wasn't too far out in her appraisal of the situation. At that time, art wasn't considered to be a serious career choice for working class lads and hadn't really occurred to him to be such until he encountered an old school friend who happened to mention that he had applied for a place at an art college, a chance meeting that was to change his entire life. He acquired a place for himself on a commercial art course at Bradford Art College, which was not ideal for his aspirations, but proved to be enough to get him accepted into London's Royal College of Art. His time at the Bradford College, during the 1950s, was spent in the company of the likes of John Loker, Norman Stephens, David Oxtoby and David Hockney (who was nicknamed 'Boris'). He eventually followed Hockney to the Royal College of Art in 1961 and recalls "Hockney would sit declaiming from window ledges while the younger students sat around like disciples. Every break time it was a cup of tea and David telling a story of how he'd been in some kind of trouble - often about his homosexuality, which was still illegal". Binder arrived in London right at the start of what was going to become known as the 'swinging' Sixties and immediately involved himself in the local 'scene', which was to sideline his painting for a while. He became involved with some events at the Roundhouse theatre where musicians such as Pink Floyd played their early gigs accompanied by incredible light shows which Binder helped to create for the venue. "The Roundhouse experience was quite something. We covered the whole of the interior with white plastic and got 12 projectors installed all around, projecting onto the plastic. Then we got film and liquid projectors and a technician from Chicago or Los Angeles called Ray. He helped us to set it up. We got various bands interested...and the BBC Radiophonic Workshop! I think they'd done the theme to Doctor Who and I asked them if they'd care to do a piece for the concert. They did it for nothing". Despite the novelty and excitement of the times, Binder admitted: "I hated it, I must admit. It wasn't really what I wanted to do. We did meet lots of famous people and celebrities: all the Beatles, for example, The Monkees, Jimi Hendrix, lots and lots of people. We went round in a car we'd painted ourselves which was really quite something. It was a Buick and we used to tour London in that with 'River Deep, Mountain High' playing as loud as we could. That's about the only good that came from it really. In another nine months we were exporting to Macy's in New York and that kind of thing. We sold to The Beatles. We did Paul McCartney's piano"! Although self-confessedly not ever a huge fan of The Beatles' music, he developed quite a close relationship with them as he recalls in the anecdote: "We got invited around for dinner when they were writing the music for Sergeant Pepper. We went up to Paul McCartney's bathroom and they were writing and singing there and they asked if we'd wait downstairs - 'We'll only be an hour and then we'll come and have dinner'. I thought we couldn't really crowd them like this, so we went downstairs! We had dinner with them a couple of times. On the second occasion, we'd stayed rather late and were watching television. In those days everyone was taking drugs and we were no exception - nothing too heavy, just some smoking - and we were just watching a blank television with all the electrical spots coming on and bleeps and all that. Paul McCartney was thinking we were looking at the night sky. We all joined in and tried to see the same pictures". Despite many happy memories, he became increasingly aware that the business scene of the time also had a darker side. "At the Roundhouse we got mixed up with pop promotions and that kind of thing and, again, I hated it all. It got very risque, almost dangerous, at one time. There were some concessions, you know like hot dog concessions, which the Greek families and the East End families were vying for and fighting over. Some serious stuff - we're talking about machine guns propped up in the corner. One of them, we were told, was a hit man. Like a lot of them he was immaculate in his presentation. He changed his shirt three times a day, immaculate fingernails, blond hair, blue eyes. All the cliches you could muster! We never found out if it was true or not". "There were some good times...but I wasn't painting and I wanted to get back to painting. It was basically three years I'd lost from doing what I really wanted to do. It became a trap." David Vaughan, born on 8th May 1944, was a psychedelic artist who obtained commissions for his brightly painted furniture from Princess Margaret, did some work in the early Sixties for The Beatles and whose work was used in a series of posters by photographer David Bailey. He also managed the Roundhouse theatre, booking Jimi Hendrix for his first performance in Britain for which Hendrix was paid £50. Possibly his most famous commission was from the owners of the Lord John boutique in Carnaby Street to design and paint a giant psychedelic mural on the three-storey high building on the corner of Ganton Street. Whilst working from a cradle on the third floor, a visitor released one of the securing ropes, causing the cradle to drop go, plunging the cradle to street level with Vaughan ending up trapped underneath the visitor's body. Although seeming to be physically unhurt at the time, he apparently received an undiagnosed head injury. Instead of being taken to hospital for examination, friends gave him some LSD to 'calm him down' which badly affected him. Following the incident he spent three years as a 'down and out' and suffered from manic depression for the rest of his life. 'Carnival of Light' was an experimental piece by The Beatles, recorded on 5th January 1967 during a five hour session that included the vocal overdubbing session for the 'Penny Lane' song. It was created especially for events at the Roundhouse theatre titled 'The Million Volt Light and Sound Rave' (also known as 'The Carnival of Light Rave') which were held on 28th January and 4th February 1967. In December of 1966 BEV had recently carried out a psychedelic decoration of Paul McCartney's piano. On delivering it to Paul's Cavendish Avenue address, David enquired whether McCartney would like to contribute a piece of music for the planned 'Million Volt' show and was pleasantly surprised when he agreed. According to descriptions of the session given in Record Collector magazine the four-track recording begins with track one as basic drums and organ rhythm backing and track two as sound effects and distorted guitar. Track three consisted of John and Paul screaming like "demented old women", according to one account, with John crying "Barcelona!" while Paul screams, "Are you alright?," with added whistling and water gargling. Track four had more sound effects, tambourine shaking and tape echo. The track ended with Paul shouting to the sound engineer, "Can we hear it back now?". The 13 minute 48 second track was mixed down to mono and a copy was given to Binder, Edwards and Vaughan. It was used for this one event and hasn't been heard in public since. In November 2008, Paul McCartney confirmed he still owned the master tapes, adding that he suspected "the time has come for it to get its moment. I like it because it's The Beatles free, going off piste". Beatles producer George Martin, however, felt it was a waste of time. When asked twenty years later if he remembered it he replied "No, and it sounds like I don't want to either!" The event was an art festival organised by Binder, Edwards and Vaughan as a showcase for their music and electronic light shows and featured performances by Unit Delta Plus, whose members included electronic music pioneers Delia Derbyshire and Brian Hodgson from the BBC Radiophonic Workshop and electronic artist Peter Zinovieff. Dudley Edwards attended art schools in Halifax and Bradford before becoming a co-founder of the BEV 'Pop' collective. During the Sixties his psychedelic murals and designs were appearing everywhere, from the fashion boutiques of Chelsea and Soho to Paul McCartney's 'magic' piano and his many collaborations included the likes of The Beatles, The Who's Pete Townshend and The Faces. Dudley recalls: "I was doing murals for The Beatles. I did a mural in Paul's house and I lived with him for six months and then a mural in Ringo's house too, when I lived with him for six months. This was at the time of Sergeant Pepper. Originally Paul asked me to stay with him and I realised, after a short time, that Jane Asher was away in America doing some theatrical production and that he didn't really want me to paint a mural, he just wanted company, because every time I got started painting Paul would say, 'Come on, let's go off to the recording studio'! 'Come on, let's go off to a nightclub'!, 'I've got a meeting with Epstein, will you come along'? " "I was just a friend, really, but after Jane came back he told me Ringo wanted a mural and I went over to live with Ringo. I found out that Ringo didn't want a companion, he actually wanted a mural painting." The psychedelic murals were certainly not limited to walls as Dudley explains: "I was actually painting a car for a guy called Tara Browne and he was the one who was mentioned on the Sergeant Pepper track blowing his mind out in his car. He actually got killed in a car crash. We were painting Tara's car and Tara was a close friend of Paul's." 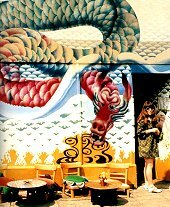 In 1967 Dudley Edwards and Michael McInnerney formed a partnership called ‘Omtentacle’ who were responsible for many more psychedelic creations, the most famous of which were probably the fascias of Gandalf's Garden and The Flying Dragon tea rooms at 436 Kings Road. "The tea house was commissioned by Puss Weber and Barbara Allen and produced by the design partnership ‘Omtentacle’ comprising myself and Dudley Edwards. The exterior of the restaurant (covering the whole window and facia board) depicts a heavenly dragon descending to earth, symbol of God's compassion, a tear from its eye waters the earthly dragon in the form of a plant (the entrance door to the restaurant), symbol of God's presence on earth. The dragon's fiery breath parts the water on the beach to reveal the shop window and interior of the tea house. The 20' x 30' shop front was prepared with several layers of hand-sanded primer. Flamboyant coach paint, mixed with white household paint, produced a radiant colour to paint with. The snaking body of the heavenly dragon was first prepared with silver leaf by F.G. Fowle (the fairground artist) before being painted in order to create a reflective surface for the setting sun along the Kings Road. The interior depicted a rising and descending white horse on opposite sides of the room, symbol of the earthly roamer. Two 42 sheet Anchor butter posters where obtained from the companies ad agency in order to montage its’ grass image onto the wall. Two cloud machines, placed in opposite corners of the room, created moving clouds and artificial grass placed as carpet with tables and cushions completed the outdoor effect". When Omtentacle disbanded, Dudley Edwards went on to co-direct (with Martin Cook) a documentary film called ‘Fred’, about a devotee of Meher Baba, for Pete Townshend. Douglas Binder was the founding curator of the Dean Clough Galleries and is currently Dean Clough’s Painter in Residence. Dudley Edwards moved into painting, ceramics, photography and textile design, establishing design company Amazed Ltd with his wife, Madeleine. David Vaughan (father of actress Sadie Frost) returned to painting portraits - Lennon, Dylan, Gallagher and also pencil portraits of David Beckham and Jude Law. He died on 4th December 2003. Godfrey Townsend Music - Who is Dudley Edwards?